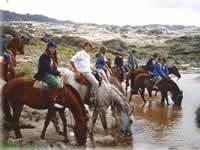 The trips or walks to horse can have of different duration. The ideal thing is to carry out them accompanied by guides baqueanos with knowledge of the handling of these animals and of the topography of the place. In the Villa of Merlo different types of cavalcades can be made: for simple paths from those that is possible to appreciate the autochthonous flora, until the cavalcades to the Sierra Edge, even arriving to the Aspero Hill, an old town abandoned miner after the Second World War, at the moment it is reconditioned as mountain refuge that offers the possibility to camp, the day to happen or to stay in the housing.